Thank you all so much for keeping up with Runway to Hallway over the past months and giving me great feedback! I’ve enjoyed working on this blog and plan to continue blogging, but on my other fashion website: ModaLove. I’ll be moving Runway to Hallway posts to ModaLove where you’ll be able to keep up with me from now on! You can also follow the ModaLove twitter, or like it on Facebook. Hope to see you all over there! 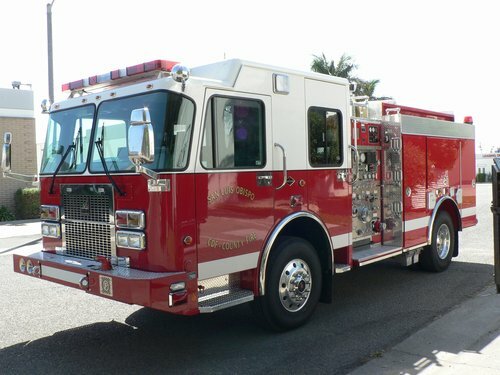 San Luis Obispo's fire department will be able to update their outdated equipment with the help of the grant. Congresswoman Lois Capps announced that the San Luis Obispo fire department will be receiving $49,000 in grants from the U.S. Department of Homeland Security Assistance to Firefighters Grant program. The fire department will be able to purchase new thermal imaging cameras so that firefighters will be able to locate and rescue victims in a fire quickly. The end of the quarter is quickly nearing, which means that the class that I’m working on this website for will soon be over. How do I feel about this? Bittersweet. I’ve loved working on this blog as much as I’ve loved the class, but that doesn’t mean that Runway to Hallway will disappear. But for right now, it’s time to briefly look back and then look forward. Looking at my first posts and comparing them to my more recent ones, I’ve realized they’ve became more engaging and lively to read. This is evident through the amount of comments and likes I’m now receiving..
Also, in comparing my posts to each other, I’ve realized that my writing has definitely improved. It’s stronger which also helps the above bullet: making my posts more engaging. Looking at my site stats, I’ve realized I’ve gathered an audience. More people are visiting my site and many are coming through it by searches on Google. After this class is over, I’m planning on continuing Runway to Hallway because I simply love what I have been doing with this site. However, Runway to Hallway will be moving to my personal fashion site: ModaLove. With this move, I’m hoping to create a name for myself and ModaLove as well as further it so that it can be a site that is looked up to. Thank you all so much for contributing to Runway to Hallway and I really hoped you all enjoyed this site! Look forward to the last post of the quarter this Tuesday to see what college men really think about the way college women dress. Fashion is a vague term and many don’t actually know the real definition. In fact, most of the time, it’s relative to however one describes it as. So this week, I made a podcast for listening pleasure, on what fashion really is and how it can keep someone continually interested. Shopping can be difficult, especially when there’s a budget to stick to. So check out Runway to Hallway’s twitter to find out what’s on sale where in San Luis Obispo. I’ll be live tweeting from downtown. If you’ve found a great sale, tweet at me! I’ve absolutely loved working on this site for all you lovely readers out there! It really has been great working with my own loved topic and generating my own content so that you, the reader, will learn something new. But with winter quarter already more than half of the way through and the journalism class I’m working on this site for almost over, it’s time to look back. Looking at my past posts, I’ve realized that I need to work on engaging my readers more either through polls or just through content. It’s also important to have good writing style, especially for the Web, and I think I’m doing fairly well in writing in a conversational and bright way. Also, a website’s layout is important in gaining an audience’s attention. After playing with a few themes and finally deciding on the one I currently have, I think it’s a great choice for a blog like mine as it visually attracts the reader. The Runway to Hallway twitter page and Facebook page have been especially helpful in directing readers to the site and specific articles as I’m getting traffic via those two outlets. Something that surprised me was the hits I was getting on Runway to Hallway from specific search engine terms. Obviously, supplying posts with tags is helpful in generating traffic. Runway to Hallway reaches out to a niche group: those who want to learn more about fashion and how to work with it by creating outfits. Though my site is targeted toward college students, I think that it can have a broader audience, reaching out to those who just want to learn more about fashion trends and how to wear them. For my next few posts, I’m definitely looking to improve upon them and making them more engaging and interesting. Talking about clothing and fashion in general can be difficult to make interesting for a wide audience which is why Runway to Hallway is focused toward a niche audience. But I want to try to spike an interest via my posts to a more broader audience, especially in men. Coffee and Cardigans has a very calm and inviting theme that’s easy on the eyes. I love this blog because it’s very personal but at the same time very interesting to read. Much like Runway to Hallway, Callie Gisler’s site is about affordable style, as well as reviews and beauty topics, and is focused on a college student audience. Coffee and Cardigans also generates a lot of interaction with the reader, which I believe I need to work on. Another blog I absolutely love is Just Add Glam. This site is extremely conversational and makes you want to interact with each post via comments. The layout is also visually appealing and the pictures she posts are great, making the reader want to delve into her site. It’s been great writing for all you lovely readers and I hope you all love it as well! Feel free to send me a comment or a suggestion for what you’d like to see and anything else you want to say!